Believe it or not, pot-related gifts for cannabis lovers don't have to look like a hackneyed eyesore. This list of great gift ideas is proof. As a cannaseur, I have beef with a lot of the gifts for cannabis lovers on the market. The issue I have is that it seems like people think that potheads have no taste. If you're reading this article, you already know what I'm talking about. Almost all the pot products out there have giant marijuana leaf patterns, involve hackneyed color schemes, or make really outdated allusions to famous pot smokers. Guys, it's 2017. A stoner gift need not be tacky for tackiness's sake. These tasteful gifts for stoners prove that you don't have to sacrifice aesthetics, just to shop for that one pot-smoking friend you have. Cannabis NO. 2 Indica Lava Rock Aromatic Set by Photogenics + Co.
Perhaps one of the most stylish gifts for cannabis lovers you can get is a home fragrance set that's inspired by the smell of good ol' Mary Jane. This particular home fragrance set uses real lava rock to diffuse aromatic oil. That being said, this doesn't actually have Indica strains in it. (I know, we could always wish, right?) Though it doesn't have any real cannabis in it, it smells great and will be one of the best gifts for your stoner girlfriend out there. Crystal pipes are now becoming the hottest way to smoke without a glass pipe—at least, on Instagram, anyway. It's easy to see why. Natural quartz crystal doesn't interfere with the taste of your herb, but definitely brings out that "healing crystal" vibe beautifully. If you're looking for a really elegant way to smoke, this will do the trick. If you're looking for the perfect gift for that Instagram fan, you'll enjoy this all the same, too. Yes, this is going to be one of those gift guides that will involve some smoking accessories—because, well, duh. Everyone loves having new stoner accessories and this is a list of gifts for cannabis lovers. It just makes sense. This particular grinder is perfect for breaking up nuggets, and doubles as a storage unit, too. Stylish? Absolutely, which only goes to show that smoking can always look slick. Herb Guard is a pot stash company that is known for keeping your stash fresh for months on end. Smell proof, spill-proof, and complete with a humidity pack, they're stylish cannadors that will work perfectly for the stoner on the go. If you have a friend who buys in bulk, this is a perfect gift for them. Actually, even if you're not concerned about style, this is one of the smartest gifts for cannabis lovers out there. It looks like just a necklace, right? Well, to the untrained eye, it would be. However, savvy potheads will recognize this for what it is: a roach clip. It's subtle, sleek, and made with a striking 24K gold finish. Better still, it's so low-key, most people would never think twice. Even among the most elegant of gifts for cannabis lovers, this necklace stands out as singularly stylish, don't you think? Anyone who knows anything about the 70s and 80s knows that it was a very cannabis-friendly time in history. It's also pretty safe to say that most of the major artists of the time were fans of the stuff, too. This gorgeous Campbell's Soup print is an homage to Andy Warhol and Mary Jane. Fans who adore modern art, pop art, or just a really good strain of sativa will find this to be a perfect addition to their home. It didn't seem right to have a list of stylish gifts for cannabis lovers without at least one high-end smoking accessory. This breathtakingly beautiful ashtray is made out of lead crystal, then treated with an iridescent film. People who want to have a serious conversation piece in their home will love this—even if they aren't that into smoking pot. 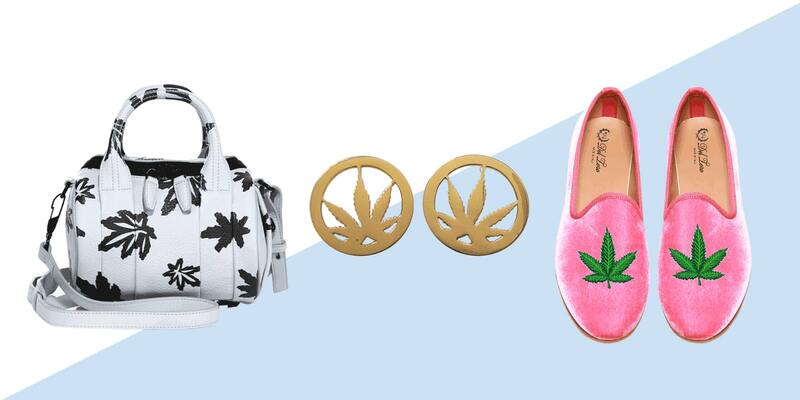 If you're more of a graffiti art person who just wants to have something a little more stoner-friendly, there are plenty of super-stylish gifts for cannabis lovers to choose from. Speaking as someone who loves seeing the wilder side of pop culture characters, this print will definitely give people something to talk about. Ideal for a stoner lounge, or just for the artist who wants something a little more provocative, this print of Snow White getting baked will definitely get comments. Darker Disney is doable, sure, but will it ever be this awesome? Free Shipping and Free Returns on MALIN+GOETZ Cannabis Set at www.barneys.com. MALIN+GOETZ's boxed set includes the brand's best-selling cannabis-scented hand and body wash and votive. If you're looking to go really upscale, there are definitely plenty of options to choose from. Super-modern designers Malin + Goetz came up with a cannabis-inspired scent line that has been making rounds in Hollywood lately. This duo features a cannabis-scented candle, as well as their popular hand wash soap, bundled up in their classic minimalist style. Like other cannabis-themed goodies, this doesn't actually contain cannabis. So, it's legal in all 50 states. Just want to point this out, there's more to canna-cooking than brownies. That's why one of the most timeless gifts for cannabis lovers who enjoy edibles is an ol' fashioned cannabis cookbook, such as Cooking with Marijuana. This awesome cookbook lets you taste the flavor of your favorite bud, and learn to make delicious recipes you can share with your buds. What's not to love about that?